« Here’s the tree frog! A friend put this up on Facebook, and I am not at all sure it’s for real, but it could be from a police department with a sense of humor. Todd Baxter is indeed listed as the Sheriff of Monroe County, New York. And even if it’s not real, it’s pretty damn funny. You’ll recognize the references from the Roadrunner and Wile E. Coyote cartoons. This entry was written by whyevolutionistrue and posted on August 28, 2018 at 3:02 pm and filed under Uncategorized. Bookmark the permalink. Follow any comments here with the RSS feed for this post. Both comments and trackbacks are currently closed. Well Coyote is a trickster. No reference to Roadrunner. Although not many roadrunners in NY. I was quite surprised to learn that a real bird is called roadrunner. The calories-in, calories-out imbalance, ACME notwithstanding, strongly suggests that in real life coyotes don’t target roadrunners. Roadrunner was one of my favorite cartoons. I hate the real coyotes as I fear for my cats. My security camera has caught them running through my backyard in the middle of the night. I bring the cats in at night but I know the coyotes are also active during the day. You are correct to worry about that. We lost a cat several years ago to the coyotes. I am still kicking myself for that one. Well I don’t doubt it’s upsetting to lose a cat or poultry or similar to Coyote but on the other hand it’s a native North American species that shows an impressive adaptability and ability to survive in a wide range of hostile environments. There’s something to admire in that and as they were certainly present in North America long before Europeans showed up and created the US of A I’d argue that they have a right to their place on the land and it’s up to human farmers and pet owners to protect their charges properly (and without resort to poisons or inhumane traps or, ideally, shooting them). As I understand it the species is doing well and there is no risk of them being wiped out any time soon and I for one am glad of that. Despite their having eaten two of my kitties, I do feel sorry for the coyotes in my neighborhood, who are being choked out of their natural greenspaces. They are quite beautiful animals too. We have coyotes living in our area. My cat and I had one casually trot within 20 feet of us early one morning as we were standing together on our front porch. The neighbors dog has been chased across our backyards at least once, in day light, with several people around. We hear them regularly at night. Sometimes far, sometimes like the whole group is right outside the window. Any sightings I’ve had, even the 20 foot encounter, the coyotes have completely ignored me, though I’m sure they were aware of me before I was aware of them. Any that I’ve seen have also looked healthy and, well, beautiful. I don’t discount the possible dangers, particularly to pets, but I am actually very happy to live with coyotes in the neighborhood. They seem to have adapted very well and in such a way that they are not nuisance enough to enough people to get themselves killed or relocated. I suppose there is a realistic reason to call 911, which is where the coyote shows signs of significant illness, consistent with having rabies. True. I see them often, but if they seem appropriately shy I don’t mind. A few years ago, there was quite the coyote debacle up near Seattle. There were three coyotes who had made themselves at home in an affluent neighborhood and ate a pet or two. Then they began to follow kids home from the bus stop. An USDA Urban Coyote Specialist was called in to work on the situation (euthanize the coyotes), but one of the town council people also happened to sit on PETA’s national board and was not pleased. People began protesting the UCS and were wearing buttons in support of keeping the coyotes. The UCS had to testify in front of the town council about why they couldn’t be left or removed (they would come right back) and he ended up having to do the operation stealthily under cover of night. They later found out that a woman had been leaving 40lb bags of dog food out at night and that was what attracted them to the neighborhood in the first place. A very sad story that we wouldn’t have heard about if it weren’t for irresponsible humans. Reminds me of my years living in California, where very strong sympathies for wildlife are never far. I can normally align with such sympathies. But on one occasion a mountain lion had stalked and killed a jogger. It evidently had lost fear of people, and so it was ‘taken out’. This was not done out of revenge, but for the sake of public safety. Other options like live trapping or darting were possible, but those methods have a higher rate of failure and meanwhile the clock was ticking. The reasons for the action taken were communicated very clearly to the public, but still there were impassioned protests by some who did not — could not — see that public safety should come first. Tha woman was Moron of the Year! Well, you should stay away from such individual animals. Which may be why the poster list signs of rabid coyotes that you can see from afar. I’m probably not the person whose post you saw on FB, though I did post it also. A quick Google search shows images of the same “letter” from various law-enforcement agencies going back at least 4 months. I’m a bit disappointed that I fell for it, though it’s still a funny bit. Found a reference more than a year old. Fort Bend, TX. Still don’t know if there’s a real, original post. This is the MCSO facebook page. No sign of the Coyote thing in August & I can’t be bothered to look further back. Most notable thing about the facebook from a Brit POV is that sheriff Todd K. Baxter sure loves a post that includes his own mugshot – I suppose he’s elected & political showboating comes first. Whoever does the political showboating of one’s (ugly, orange) mug remind me of??? Cannot imagine a worse man. It must require a peculiar degree of ego and stupidity to piss off a magazine whose cover you desperately want to feature on. Beware ostensible tunnels on cliff-sides. Why? Those tunnels work very well for everything but the coyote. I don’t know why we don’t make more use of coyote engineering skills. Need a tunnel through a mountain? Just get a coyote to paint one on its side. I think this is real. 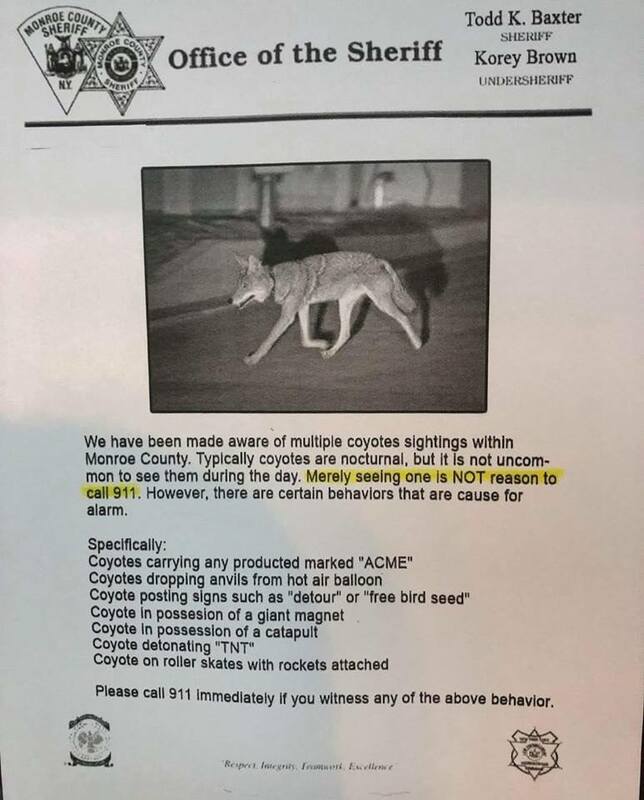 And it makes sense: you’re NOT going to see a coyote doing any of these things, so leave us (the Monroe County sheriff and others) and the coyotes alone! There will come a time, sadly, when a future generation will not know of these cultural references. What is this about coyotes and ACME and TNT? They will ask. Perhaps that generation is among us now! There will come a generation, maybe already, who doesn’t get to see the full cartoons – they’ll get some special, explaining them and showing snippets, the same thing that happened to the Laurel & Hardy, Little Rascals et al that I grew up on. Far worse has already happened, starting many years ago. New versions of classic Looney Toons cartoons, often featuring the children of the original characters. OMFG, they are horrible. Even my kids, the target audience disliked them. Being a responsible parent I of course introduced them to the originals, which they of course loved. But countless poor children have been raised on nothing but the awful derivative shows and know nothing of the originals. It’s like a re-writing of history! Or perhaps it was all a small part of a nefarious plan to dumb down America, starting with children, by replacing the clever, multi-level originals with horrible, cloying, simplistic garbage. My 2-yr-old granddaughter loves a very cute Russian cartoon series called Masha and the Bear, sans subtitles. At night here in NW MT, the coyotes sing to one another across the valleys . . . very melodic, with occasional “yips” thrown in. I never let my cats outside so don’t worry about them, but the wild turkeys seem to be avoiding them quite well. I guess wild turkeys and coyotes have coexisted in North America for a very long time. That punch line really makes it great. Love the RR skull on top of the tv. I’m not sure about western NY where Monroe county is but in the NYC area coyotes were once very rare. Coyote sightings even made the local news. A lot of people were kind of freaked out about seeing large predators in their neighborhood and started dialing 911. The local authorities told the public to be alert but not to panic. A sign like this could address that with some humor. I live in that Monroe County (used to live in Florida’s Monroe County, too-go figure), and I have to say that I can find very little humor in the Sheriff’s approach to law enforcement. I have seen foxes, turkeys & deer in the back 40, but no coyotes. In any case, we don’t let our cats out. Coyotes are such jerks. One time, I was eating a lovely dinner at a very nice steak and seafood joint. Just as I was finishing my stuffed lobster tails, a coyote came up behind me and choked me out, took my wallet, and threw my food on the ground. I was shocked when I saw my first real roadrunner on the road in Arizona. They are soooo much smaller than Wile E., which fact you would not glean from the cartoons. But I greatly enjoyed the Warner nature documentaries as a kid! Say it ain’t so! Coyote – can only fly using Acme rocket that will blow him up. It’s a shame that Wile E will be rembered for his obsessive pursuit of roadrunner, rather than for being the most talented painter of tunnels from his generation. I misread this title as “Acme Coyne Watch.” Ha ha.